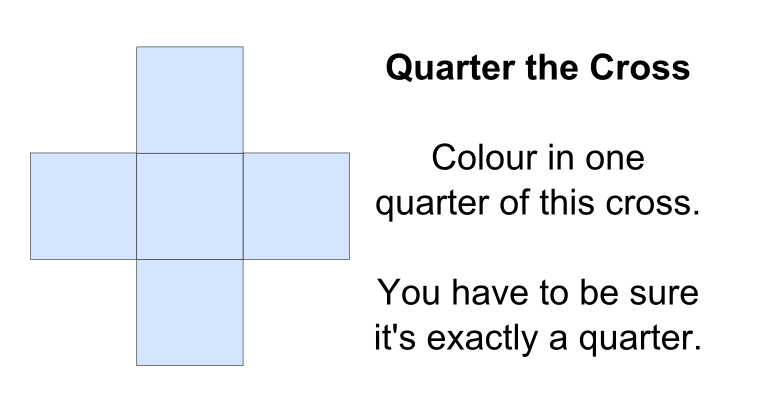 At the end of last year, the MTBoS (Math(s) Twitter Blog-o-Sphere) introduced me to this very interesting task: you have a cross made of four equal squares, and you are supposed to colour in exactly 1/4 of the cross and justify why you know it’s a quarter. I call it “Quarter the Cross”. I was hooked from the moment I saw it. It had so many many possibilities for maths thinking and argumentation and creativity too! I couldn’t wait for the December session of One Hundred Factorial to try it out with others. And I was not disappointed: we all learned so much from each other and were inspired by each other to new heights of creativity and wonder. Since then I have been trying to write a blog post about it, but every time I try, I get inspired one more time and end up working on new solutions for several days. Along the way I’ve learned a few brand new things; I’ve relearned a few things I’d forgotten; I’ve seen things I knew with new eyes and understood them better; and I’ve made brand new maths (for me anyway). And all of these intersect and combine to make even more new learning. How can I possibly organise all of this into a blog post? So I’ve decided not to try to organise it in any particular order. Instead I am going to show you a collection of solutions, and a collection of ideas I used to make them. My hope is that you can enjoy going on a similar journey to mine. If you do make any more solutions or have creative ways of explaining why mine work, you can tweet them with the Twitter hashtag #QuarterTheCross — I’d love to see anything you come up with! UPDATE: I wrote a later post on how I implemented this in a classroom. Over there I have links to the Word documents with blank crosses to print for students, but you can get them direct here: here is the small version with five crosses, and here is the big version with one cross, both with a whole number of centimetres for the squares’ sides. 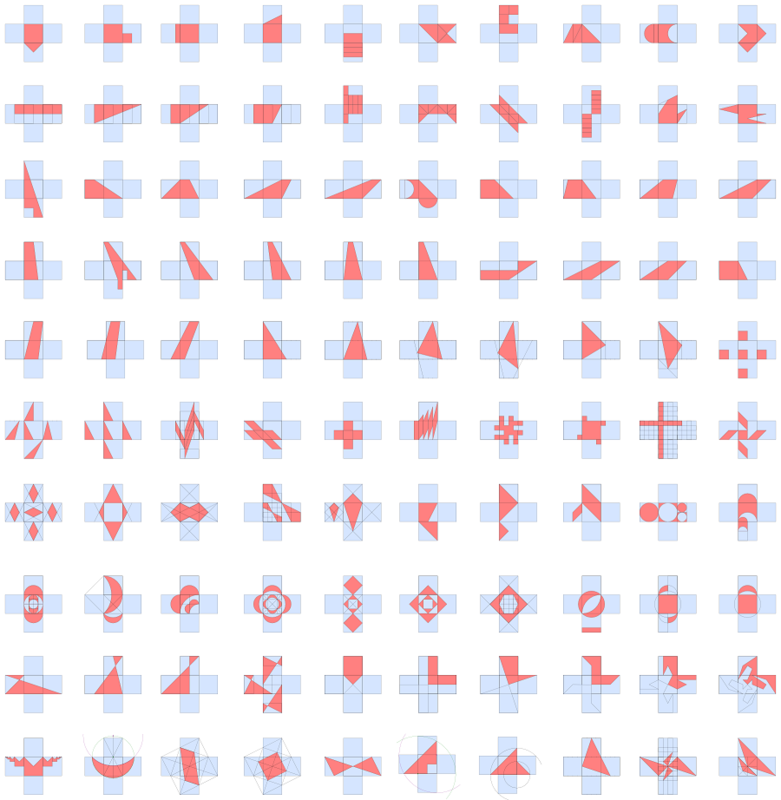 This is a picture of 100 of my solutions. In each, a quarter of the cross is coloured in red. You can explore a prezi of them here. A high-resolution picture can be downloaded here (PNG 4MB) and the original SVG file here. Halving retangles and triangles using symmetry. Adding a bit to a shape and taking the same bit don’t change the area. Moving the apex of a triangle parallel to its base doesn’t change the area. Shearing a shape doesn’t change its area. Making a shape half as high and twice as wide doesn’t change the area. Shrinking all the lengths by half makes a shape with a quarter the area. The formula for the area of a trapezium. The formula for the area of a crossed trapezium. The sum of a geometric series. This entry was posted in Isn't maths cool?, One Hundred Factorial, Thoughts about maths thinking and tagged fractions, geometry, play, puzzles. Bookmark the permalink. Awesome stuff, you should use this print for a book cover or artwork (but don’t put the title in – let people work out they are each a quarter). Found your post on the twitterverse. I will be looking at this for awhile. I think with some creativity, I can use this with my kindergartners. I agree with the book cover idea. Thanks for the post. Around Christmas last year I did a colouring activity with my seven-year-old. I had a star made of twelve equilateral triangles – a hexagon with a triangle attached to each side. I asked her to colour half the star in one colour and half in another colour. I had a pile of them for her to do in different ways. It worked really well. Beautiful. Can you use fibonacci as well? Great idea! I plan on using this as a post-examination activity with my IB Math kids. They’ll have to use integration of a non-linear function to quarter the cross.